This was a staple in our house growing up, and consequently has a soft spot in my heart. So easy and quick, it’s a great weeknight meal and is always a hit (even with kids!). It can be done on the bbq or in the oven (on broil), so it’s easy to adjust to the season. Best served with grilled veggies. This marinade is not an exact science, and feel free to approximate. Combine all the ingredients in a bowl. 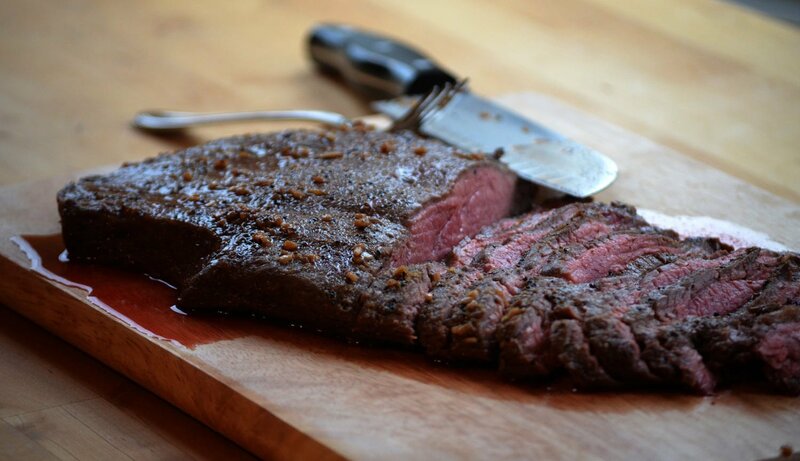 Toss into a large ziploc bag with the flank steak. Marinate in the fridge for a few hours to absorb the flavour. Make sure to flip the steak at least one to ensure both sides get the flavour. On the very top shelf, broil in the oven on a cookie sheet until medium rare. About 4-5 mins a side. It can also be cooked on the barbecue on high heat. Let rest for 5-10 mins to let the juices reabsorb into the meat. Thinly cut the meat against the grain and serve.